Someone did! A member of the royal family of Qatar, Sheikha Mayassa bint Hamad al-Thani, dubbed the most powerful woman in art, reportedly bought Three Studies of Lucian Freud. The painting sold for $142 million dollars. 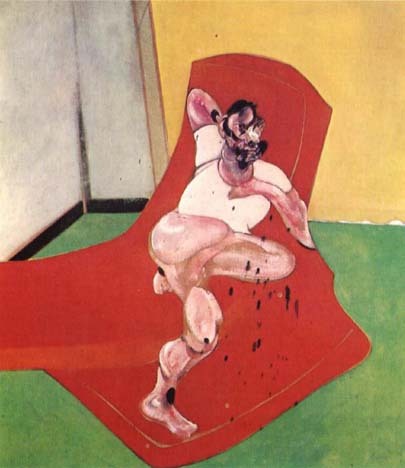 Artist Francis Bacon was born in Ireland but lived his life in England. He had a dreadful childhood at the hands of a cruel father. He lived through the grisly carnage of WWI and WWII and seems to have been driven mad by the temptations and horrors of the 20th century. But hold on…Bacon paints as if he were an old master from 400 years ago. His paintings drip with opulent color and a velvet magnificence. The pain and brutality that punches through them heightens their strange beauty. The question remains: Is that strange beauty enough for you to buy this painting? Visit Francis Bacon’s studio, unbelievable! Click here to view the video. The strangeness of the paintings is evident; the beauty less so. If I had 124 million to squander, I would certainly NOT buy either of these pieces of bacon. Maybe a giant LBT! Always food for thought. Good question! Unfortunately, I do not have the money to even consider it! That makes the decision easy! haha However, I love when a painting evokes strong emotions – and Bacon’s works do that. Otto Dix is one of my favorite artists – not always pretty to look at, but I’d buy it & hang it in my house in a heartbeat! Thanks for posing the question and sharing Bacon’s work! Just because it’s disgusting and sticks in the mind doesn’t make it great art. You can get the same effect from photos of the grossly dismembered on the battlefield. If I wanted to look at the art of the mentally ill–and Bacon is clearly mentally ill–I’d rather view the well-known art of schizophrenics. Such art seems to have an aura of the spiritual at least. ….and no, I would NOT buy his paintings. In fact, I would pay not to have one anywhere near me. Bacon sure does bring out strong opinions! But so true, Ken, not a good criteria for good art. No, I would not buy the painting if I had millions! And it kind of gets to me that the world has decided his work is exceptionally great. On the other hand, I appreciate being educated about him; and his painting DID make me stop and ponder the juxtaposition of the style mixed with the content. Still, just because something makes me think, doesn’t necessarily mean it’s great and worthy. I am a fan of Bacon. He takes the dark side of life and presents it in a creative manner, albeit it is scarey, but it is life. He disprupts the views of the pristine thinkers with his chaos and disorganization in an imaginative way. Interesting article. No, I would not buy the painting, but to each his own. Thanks for illuminating us.